apparently originally photocopied in the first Bush administration, this barely readable pamphlet sits in the jury room. I’ve never been called for jury duty. Never. Even though I vote (I swear!) and have a driver’s license. I guess it’s because I’ve moved around a fair amount, between states and interstate, over the last several years? Well, maybe it’s a sign of more permanent residence because I was summoned to jury duty in Philadelphia last week. Course, my mind went to one thing–Reading Terminal Market, located one block from the justice building. Particularly its policy of giving jurors a 10% discount at a number of vendors. Hard to resist. Jury duty is a study in contrasts. On one hand, the whole process proceeds with a smooth, bureaucratic efficiency that nearly hums. Fill out forms. Get juror number. File into courtroom. Decide someone’s fate. On the other, it’s a defiantly human system, with all the idiosyncracies that suggests. Like the strangely worded questions that can cause metaphysical consternation–would I believe the word of a police officer more than someone else? Have I been the victim of a crime? Or, like the prosecutor who looked eerily like Jerry Stiller, but who acted like Jerry Lewis, dropping papers, saying “um” while addressing the jury, and apologizing for losing his notes. Even the court clerk, an attractive woman with blow dried helmet hair and a brisk demeanor, shook her head in disbelief. I wondered which branch of central casting he came from. Hey, Nice Lady? Maybe you can help him out? All this self-questioning and evoking of hardships (what an archaic word! 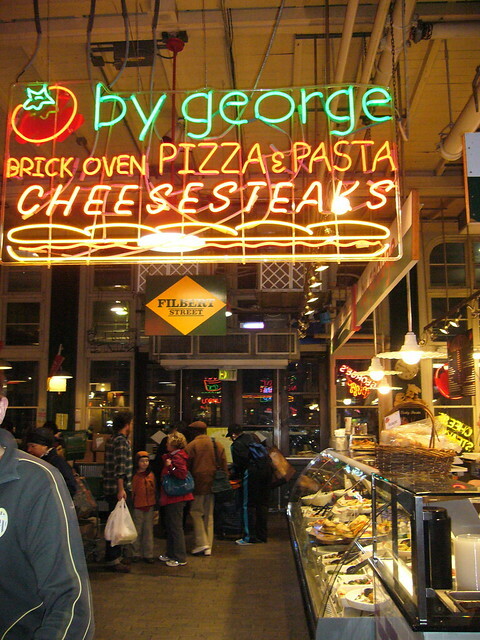 ), leads one to hunger, so I found myself at the Market in front of By George Pizza, Pasta & Cheesesteaks. Since my partner doesn’t eat much in the way of cheese, unless its vegan–also known as devil spawn–I haven’t had pizza since I’d moved to Philly. In fact, the one night I convinced him to go to Birra with me, the electricity went out at the restaurant and they couldn’t serve us. Course, that left me with an appropriate craving for By George. There’s a brick oven there, a good sign that I got to consider while some tourists confused an already exasperated pizza slinger. I wanted to try a standard and then a fancy slice, so I started with what looked like a not-quite-tomato-pie and not-quite-margherita slice. Mostly covered with tomato cause, it had small rounds of mozzarella but no basil. For the second, I ordered a vegetarian behemoth, which essentially was a dressed salad on top of a pizza slice. The line grew behind me and as every man on it only ordered one slice, I, a former fat kid, felt a bit of shame as I was handed my heaving paper bag. While I’m a lover of a classic pizza slice (god rest DeLorenzo’s in Trenton), this tomato pie was a bit underwhelming. By stacking my second slice nearly on top of the other to fit it in the bag, the cheese had mostly been pulled off. The tomato sauce was sweet, no bite to it. The crust was crisp, though, but still foldable, important to a Jersey girl. For lack of a better name, the salad slice was excellent. Covered in a weighty mix of spinach, artichoke hearts, kalamata olives, tomato slices, and a hard, salty cheese that may have been feta, and dressed lightly in a vinaigrette, the slice was anything but bland. The mix of textures–soft tomato v. toothsome cheese v. bitter spinach v. briny olives and artichokes–kept it interesting. The main misstep were the tomato slices. Round discs, they still had their leathery skins which peeled off in long ribbons in my mouth, an unpleasant feeling. Leaving just some heels of crust behind, I returned to the jury room. The bureaucrat who was running the proceedings asked whether any of the hundred or so people waiting there were supposed to be in a courtroom. When one woman stood, she was politely told that she was late. When it was clear that she’d gone, the bureaucrat conspiratorially whispered into her microphone that the rest of us were free to go home, but she just didn’t want that other woman to hear. 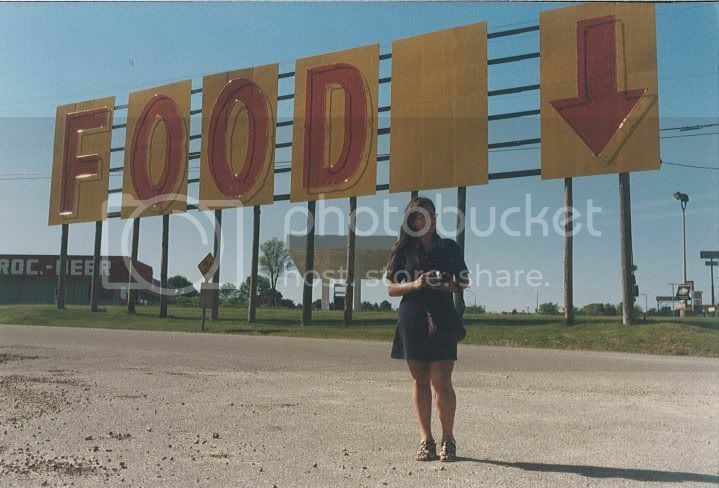 I hung around for my check. Turns out a day of my time is worth $9.00 to the City of Philadelphia. Fine with me. That’s plenty of pizza money. Recommended: go for the fancy slices at By George, like the salad slice. This entry was posted in food, Philadelphia, Uncategorized and tagged by george, Philadelphia, pizza, Reading Terminal Market, vegetarian, Vegetarian Friendly. Bookmark the permalink.